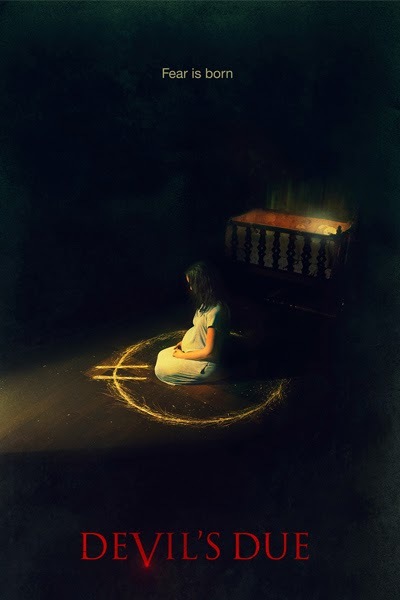 Home / HORROR/SUSPENSE / "Devil's Due" Movie Trailer and Information! "Devil's Due" Movie Trailer and Information! The most horrifying delivery is about to take place in “Devil’s Due,” a movie that employs found footage style on the coming of the antichrist. The movie is directed by Matt Bettinelli-Olpin and Tyler Gillett written by Lindsay Devlin and Zoe Green. 20th Century Fox delivers its first movie trailer of "Devil's Due" (seen below) which Wes Craven, the master of horror mentioned (in his twitter @wescraven) that the trailer is creepy and congratulates writer Lindsay as well. Starring Zach Gilford and Allison Miller as Zach and Samantha McCall as newlyweds who find themselves dealing with an earlier-than-planned pregnancy right after their honeymoon. After a mysterious night during their honeymoon, the couple notice mysterious people following and spying on them. Eventually, these people are revealed to be Christian heretics who believe they can use some of Christianity's earliest symbols to bring forth the Anti-Christ. While recording everything for posterity, the husband begins to notice odd behavior in his wife that they initially write off to nerves. But as the months pass, it becomes evident that the dark changes to her body and mind have a much more sinister origin. “Devil’s Due” will arrive soon in Philippine cinemas from 20th Century Fox to be distributed by Warner Bros. The movie trailer is posted below.